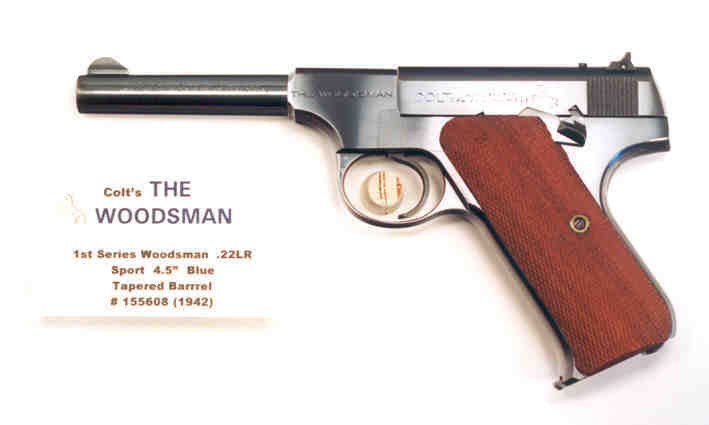 Woodsman 1st Series Sport .22LR 4.5" Blue, 99.8%IB, SN#155608 (1942) tapered barrel model with correct mint (not darkened by oil as is prevalent with Woodsmans) nicely figured original walnut grips, correct original mainspring housing for high speed ammo, correct blue magazine, correct fixed trapezoidal front sight, mint bore, in way above average correct box not numbered to gun with end labels mostly intact and correct, Xerox copy instruction manual. All markings correct. Gun is strikingly MINT!